After working with your database, you might find that you need to make some changes to the tables that store your data. 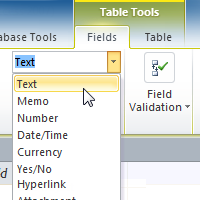 Access makes it easy to modify your tables to suit your database's needs. In this lesson, you'll learn how to create and rearrange table fields. You'll also learn how to ensure that your table data is correctly and consistently formatted by setting validation rules, character limits, and data types in your fields. Finally, we will direct you to additional options for doing simple math functions within your tables.